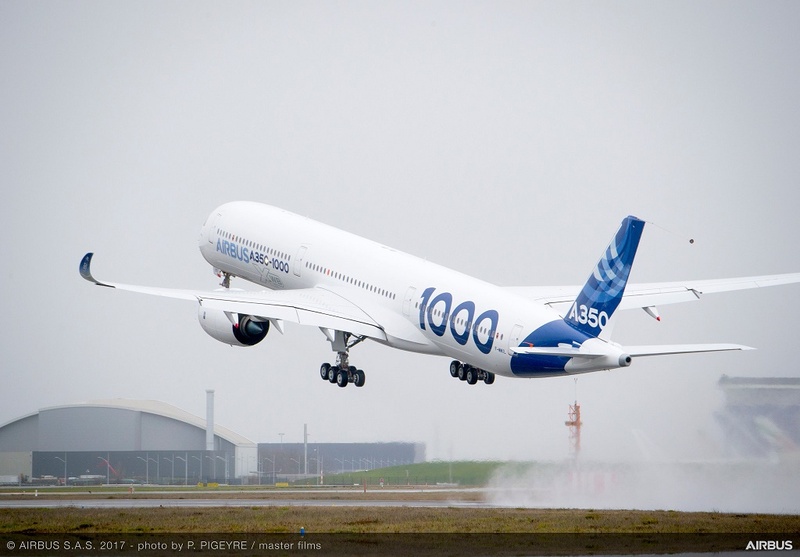 sn26567 wrote: First flight of the A350-1000 : Thursday 24 Nov morning in Toulouse ! Airbus to launch the maiden flight of its first A350-1000 on 24 November 2016. Serial 059 is powered by Trent XWB-97 engines. Airbus plans to deliver the first A350-1000 to launch customer Qatar Airways by end of 2017. Why are the pilots equipped like if they were at the helm of a fighter-bomber aircraft? It's not like if the A350-1000 was an all-new model! sn26567 wrote: Why are the pilots equipped like if they were at the helm of a fighter-bomber aircraft? It's not like if the A350-1000 was an all-new model! Imagine yourself to be onboard, this aircraft model hasn't flown 1 minute, you would be sitting there with your shorts and flipflops enjoying the free ride??? They seem to be wearing both a parachute and a life vest too, ready to bail out I suppose. Not only the first-flight/prototype aspect, look in history how many accidents happend because of all the chase-planes nearby. I personally lost 3 acquaintances in a chase/photograph-plane mid-air; not that parachutes would have saved them in that particular case. Even if for the A350 crew maybe only 2/3 of the flight envelope allows a safe bail-out and probability of such a major mishap is far less than 1%, every (easily) available precaution should be taken. Only 3 things matter in aviation: Safety, Safety and Safety. of any ("recent") Boeing first flight showing their pilots equipped like this? Is there any reason why the space between the cockpit windows is always painted black, and not in the coulours of the rest of the fuselage? Saw a Finnair A350 at LHR this morning, I was impressed! Airbus reached its target for at least 50 deliveries of the A350 in 2016, out of 670 total deliveries predicted for 2016. KLM plans to receive its first A350 in 2020, with delivery of seven A350-900s by end of 2022, along with another six B787-9s by end of 2019 and seven B787-10s in 2019-21 period. Sister carrier Air France is set to receive its first A350 in 2019. Aeroflot cancelled eight A350-800s on order back in November 2016, leaving carrier with only 14 A350-900s. This leaves Asiana as the only airline that still has A350-800s on order (8 aircraft, with also 12 A350-900s and 10 A350-1000 on order). I wonder when they will convert/cancel their order. SriLankan Airlines' order of four A350s scheduled to be delivered in 2020 will be cancelled by the government (owner), who will take strict actions to regulate the carrier in an effort to cut its huge loss and prevent corruption. They have done it: a first airline, Air Caraïbes, will get an A350 with 10-abreast seating in economy. Since the cabin of the A350 is narrower than that of the B777, passengers should not expect to have a comfortable flight! The airline is in the process of taking delivery of their first of five A350s (two A350-900s, and three A350-1000s), which will feature a total of 389 seats, including 18 business class seats, 45 premium economy seats, and 326 economy seats. They have done it: a first airline will get an A350 with 10-abreast seating in economy. Since the cabin of the A350 is narrower than that of the B777, passengers should not expect to have a comfortable flight!